Are you looking for some of the healthiest fruit options? In this article, we will look at 15 low-sugar fruits that are high in polyphenols. Polyphenols are natural chemicals that occur in a range of plant foods, and they have been linked to various potential benefits in studies (1, 2, 3). Additionally, each of these fruit options has an impressive fiber to fruit sugar ratio, making them very low in net carbs. All nutrition data is per 100 g.
Otherwise known as chokeberries, aronia berries are a small, black and sour berry. First, the bad news; aronia berries do not taste particularly good unless they are perfectly ripe. If you get them before they are ready, these berries will have a strong, astringent taste that is difficult to enjoy. On the positive side, they are an excellent source of vitamin C and provide a significant amount of polyphenols, particularly the group of cyanidin anthocyanins (4, 5). In contrast to aronia berries, blackberries are one of the best-tasting fruits in the world. Although blackberries can be slightly bitter and sour, they match these flavors with their slightly sweet taste. Blackberries taste delicious with a topping of heavy cream, and this makes a tasty, refreshing dessert for the summer season. Nutritionally, blackberries are very similar to aronia berries and provide a decent source of vitamin C and manganese. Additionally, they are rich in polyphenols and contain anthocyanins, flavonols, flavanols, and various phenolic acids (6, 7). Blackcurrants are an interesting berry; for one thing, they are barely known in the United States yet very commonplace in Europe. Interestingly, blackcurrants were outlawed in the US between 1911 and 2003 over fears that the plant could be a carrier for fungus diseases to spread among American pine trees. The ban was overturned in 2003, but commercial production in the United States is still meager. For those who have never eaten blackcurrants, they offer a sour but slightly sweet taste, and they are often used to make tea, cordials, and jams. On the positive side, blackcurrants are extremely rich in vitamin C and one of the world’s most significant sources of the vitamin. They also contain a wide range of polyphenols (8, 9, 10). Blueberries are one of the most popular fruits in the world, and as one of the most well-studied (and best-tasting) fruits, it is easy to see why. Also, this little blue fruit grows all around the world, and significant production takes place on every continent. Blueberries have a flavorful sweet and slightly sour taste, and they can be used for all kinds of things from desserts and cooking sauces to wine. The blueberry is a decent source of vitamins C, K and manganese, and provides a significant range of anthocyanins, flavanols, and flavanols (11, 12). Capers are a fruit or flower bud that we can use as a flavoring aid or condiment in food. To eat them, first producers pick, prepare and pickle them in a commercial production process. Capers are similar to olives in this way, and eating them without preparation is impossible due to their extremely bitter natural taste. Since they are a pickled food, capers are understandably high in sodium, but they also provide a good range of vitamins and polyphenols including quercetin and kaempferol (13, 14). Cherries are delicious and one of the most popular fruits worldwide. With production peaking during the summer months, cherries are a refreshing snack to beat the heat at this time of year. Notably, there are two different kinds of cherry; sweet and sour cherries. As you may be able to tell from the name, the latter has less sugar and is not quite as sweet tasting. Sour cherries are decent sources of vitamins A and C, and they are a rich source of polyphenols, notably cyanidin and caffeoylquinic acid (15, 16). Elderberries are strong-tasting astringent berries that grow on a species of flowering plants known as Sambucus. While raw elderberries are barely edible, they are often used to make various products such as elderberry jam, tea, and dietary supplements. Interestingly, these berries should not be eaten raw since they are excessively high in cyanidin polyphenols, with concentrations high enough to cause nausea and digestive distress (17). However, once the berries have been cooked they are perfectly safe to eat. The most common (and healthiest) way to use elderberries is to steep dried berries in boiling water to make elderberry tea. Elderberries are quite nutritious, and they provide a good source of vitamin C as well as smaller concentrations of vitamin A and vitamin B6 (18). Additionally, elderberries are a substantial source of cyanidin and quercetin (19). Gooseberries have a unique and intriguing taste, but they are a little bit sour. This sour taste comes from the acid content of gooseberries, and they contain a range of different acids, including citric, malic and shikimic acids (20). 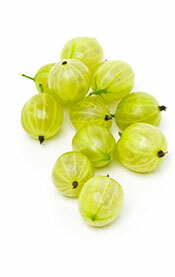 As a result, gooseberries can be an acquired taste in their fresh state and are best enjoyed by lovers of sour fruit. Gooseberries are available in both green and red varieties, and it is also easy to find dried gooseberries, which have a sweeter and less intense taste. Compared to many other fruits, gooseberries contain minimal amounts of sugar, and they are also high in vitamin C and fiber (21). As with many other berries, gooseberries contain significant amounts of cyanidin polyphenols (22). Lemons are a citrus fruit with tart and acidic properties. In fact, lemons have a PH level of about 2.2, which shows just how acidic they are (23). This acidity comes from the high levels of citric acid in lemons, which gives them a strong sour taste that overpowers the (slight) sweetness they offer. Lemons are a very low-sugar fruit, and they contain more fiber than they do sugar. They are also extremely rich in vitamin C (24). Lemons are also a rich source of the flavonoid polyphenols eriodictyol and hesperetin (25). For more information, you can read about the benefits of flavonoids here. Although not many people enjoy them in this way, lemons can be eaten straight if you can handle the sour taste. Otherwise, a slice or two of lemon works well in a range of drinks. Compared to lemons, limes are a similar-looking (but green) citrus fruit. 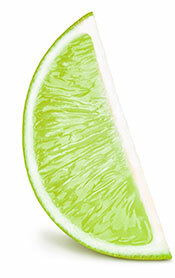 While lemons are very sour, lime has slightly more bitter notes to its flavor, even though it, too, is sour. Additionally, they do have a different flavor, and some people will prefer lemons whereas others love lime. Similar to lemons, the lime is also very low in fruit sugars and contains less than 2 grams of sugar per 100 g (26). Regarding their polyphenol content, limes provide a source of hesperetin and quercetin (27). Like with citrus fruit in general, the most significant nutrient in lime is vitamin C.
Black olives taste delicious, and they work well as a snack, as part of a cheese platter, or in a cooked dish. With a soft, salty, and slightly bitter taste, these olives provide much flavor. Notably, olives are a type of berry, and they provide a healthy source of monounsaturated fat (MUFA). Black olives do not contain fruit sugars, and standard brine-cured options provide a high amount of sodium, alongside iron and copper (28). Olives are one of the most significant dietary sources of polyphenols, and they contain substantial amounts of anthocyanins and tyrosols (29). Interestingly, one phenolic compound in olives called oleocanthal is thought to have anti-inflammatory effects similar to ibuprofen (30). 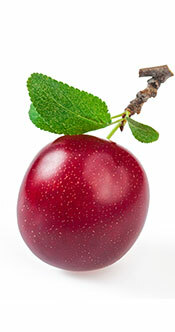 Plums are a small, round and rosy red fruit that are believed to be one of the first fruits grown by humans (31). There is also a wide range of different plum cultivars, and the fruit appears in a variety of colors from red to yellow and even green. Nutritionally, plums offer a decent source of vitamin C (32). Plums offer a range of cyanidin anthocyanins as found in berries, and also provide a source of caffeoylquinic acids (33). The raspberry is another delicious tasting berry that works well by itself or with a bit of fresh cream. These little red berries are ready for harvesting in the summer months, and they make a tasty, refreshing snack on a hot day. Concerning the nutrients they offer, raspberries share a lot with blackberries, and they are a good provider of vitamin C and manganese (34). 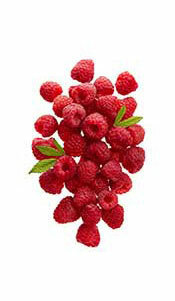 Raspberries are high in various anthocyanins and phenolic acids (35). This berry tastes different from common berries, and while the actual flavor is hard to describe, it supplies equal measures of sweet and sour. These intriguing berries get their name from the eating habits of indigenous North American tribes, who would eat the berries alongside salmon and fish roe. Regarding the nutrients they provide, the most significant vitamins and minerals are manganese, vitamin K, and vitamin C (36). Salmonberries contain a range of phenolic acids (37). It is always difficult to find someone that doesn’t like strawberries. These bright red berries are one of the most loved fruits in the world, and they are nutritious too. Strawberries are low in sugar, high in vitamin C, and they also supply a moderate amount of manganese (38). 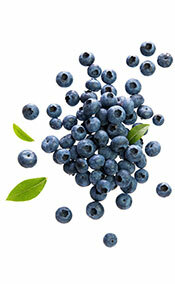 This favorite fruit also provides a wide range of polyphenols, particularly anthocyanins (39). Just like with blackberries and raspberries, strawberries make a delicious combination with some fresh heavy cream. Is Fruit the Best Option For Polyphenols? Although fruit can be reasonably nutritious and it tastes good, it is not the best source of polyphenols. Therefore, if anyone is eating fruit purely for these compounds, then it might be worth looking elsewhere. For example; coffee, tea, dark chocolate/cocoa, and red wine are all much greater concentrated sources. To read about the best drink sources of polyphenols, see this article. What Are Flavonoids and Do They Have Benefits?